The Secrets of Long Life- Okinawa Diet Plan? Many may be wondering what the Okinawa Diet Plan is? The Okinawa Diet Plan became well known through the 2002 bestseller “The Okinawa Program” written by Drs. Bradley Wilcox, D. Craig Wilcox, and Maxoto Suzuki. The book is based on a study of the elderly Okinawa residents (Located in the Ryukyu Islands of Japan) that were researched over the past 25 years. The study showed that women lived an average of 86 years old while the men lived an average of 77 years old. This culture is known for their longevity and overall incredible health. The Okinawa Diet Plan is a very plant based diet where the main foods consumed are vegetables, rice, noodles, fruits, grains, and breads. 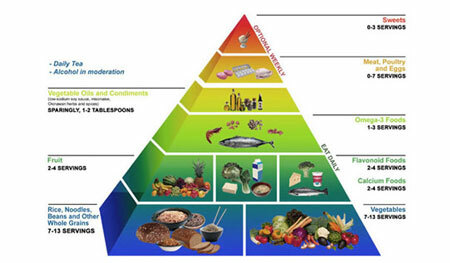 Continue reading to learn more about the diet. Calorie restricted diet: Okinawa Diet Plan is designed for you to eat smaller portions, develop a habit of eating at least 500 calories less than usual, and remain 80% full compared to 100% full. Men consume an average of 1400 calories while women consume 1090 calories daily. While in India, the average amount of calories consumed is 2400 calories. Whereas in the United States, the average amount of calories consumed is 3500. 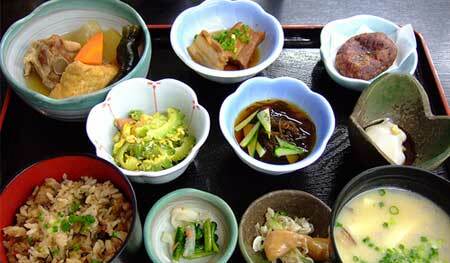 Calorie Density Groups: The Okinawa Diet Plan consists of four food groups. The first group is the “featherweights” which holds the least amount of calories. Foods that fall under this group are asparagus and green tea. The second group is classified as the “lightweights,” which consists of brown rice and fish. The next food group is the “middleweights,” where lean red meats and hummus are found. Lastly, the bottom food group is called the “heavyweights,” which consists of fried foods and desserts. This group has the most caloric intake. The diet plan sticks mostly to the featherweight and lightweight categories. Those groups are designed to keep you full without additional calories. Typical Meal Plan: Breakfast is usually green tea with blueberry pancakes made from scratch. Lunch consists of tofu, sweet potato, asparagus, and a salad. Finally, for dinner most eat tomato based pasta and add kidney beans to enhance protein. The diet is low in fat and high in fiber. People of the Ryuku Islands eat mostly fruits, vegetables, and whole grains. On a typical day, they eat 1 serving of fruit, 6 servings of vegetables, and rice is predominating in most meals. Easy Recipes: One of the most popular meals throughout the world is miso soup. EasyRecipes.com contributor Ariel Miller shared a recipe for the “Longevity Okinawan Japanese Eggplant Miso Soup.” For the recipe, you will need the following: 3-4 tablespoons of miso paste, 4 scallions, 2 carrots, 1 cup of cubed tofu, 2 cups of cubed eggplant, and 2 quarts of hot water. First, you finely chop the scallions and carrots. Next, you put water in the saucepan and bring to boil. Thirdly, you add miso paste and remained of ingredients and cook until all vegetables are tender. Lastly, remove from heat and serve soup warm. Exercise: The Okinawa Diet Plan recommends that it is important to increase metabolism. You have the decision to what exercises work best for you such as strength training, cardio, and yoga. Pros and Cons: The pros of the Okinawa Diet are that it is a research based diet that proves life longevity and improvement of health to those who have converted. Another pro is that the diet has a variety of recipes and consists of an abundance of fruits and vegetables. Some of the cons are that even though the diet has been scientifically researched, one of the concerns researchers shared was the potential risks of nutritional deficiencies. Other studies bring light to the fact that low calories can have negative long term effects to the immune system. Another con is that there is a great restriction of foods such as bread, dairy and desserts. Should you engage in the Okinawa Diet Plan: I think that if you are interested in getting healthier, then do it. I personally have a diet plan similar because I am pescatarian, which is a vegetarian that eats fish and seafood. Although, I have a much higher calorie intake to ensure that I get all vitamins and nutrients. There is an 8-week diet plan that eases you into the lifestyle. This would be a great start. You can also spend a few weeks cutting back on meat, fried foods, and sweets instead of jumping cold turkey into the Okinawa Diet Plan. The only thing I would suggest is meeting with your doctor and nutritionist to ensure this is a healthy change for your life. When becoming vegetarian, I was faced with some hair loss and nutrient deficiency. Immediately, contacted my doctor and we worked on a dietary plan that worked best for my busy schedule. Good luck on your new journey.